A team of scientists at Stanford University are working to improve energy efficiency in computer circuits by using full-wafer scale digital logic structures that are unaffected by misaligned carbon nanotubes. Energy efficiency is the most significant challenge standing in the way of continued miniaturization of electronic systems, and miniaturization is the principal driver of the semiconductor industry. “As we approach the ultimate limits of Moore’s Law, however, silicon will have to be replaced in order to miniaturize further,” said Jeffrey Bokor, deputy director for science at the Molecular Foundry at the Lawrence Berkeley National Laboratory and Professor at UC-Berkeley. These high-quality, robust nanotube circuits are immune to the stubborn and crippling material flaws that have stumped researchers for over a decade, a difficult hurdle that has prevented the wider adoption of nanotube circuits in industry. The advance represents a major milestone toward Very-large Scale Integrated (VLSI) systems based on nanotubes. “The first CNTs wowed the research community with their exceptional electrical, thermal and mechanical properties over a decade ago, but this recent work at Stanford has provided the first glimpse of their viability to complement silicon CMOS transistors,” said Larry Pileggi, Tanoto Professor of Electrical and Computer Engineering at Carnegie Mellon University and director of the Focus Center Research Program Center for Circuit and System Solutions. While there have been significant accomplishments in CNT circuits over the years, they have come mostly at the single-nanotube level. 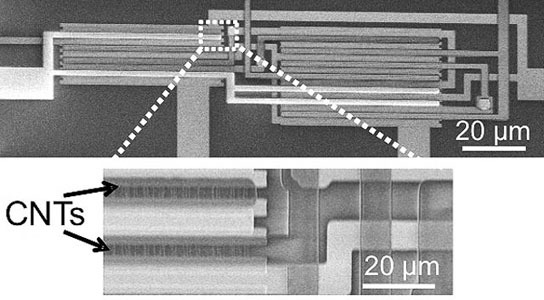 At least two major barriers remain before CNTs can be harnessed into technologies of practical impact: First, “perfect” alignment of nanotubes has proved all but impossible to achieve, introducing detrimental stray conducting paths and faulty functionality into the circuits; second, the presence of metallic CNTs (as opposed to more desirable semiconducting CNTs) in the circuits leads to short circuits, excessive power leakage and susceptibility to noise. No CNT synthesis technique has yet produced exclusively semiconducting nanotubes. “Carbon nanotube transistors are attractive for many reasons as a basis for dense, energy efficient integrated circuits in the future. But, being borne out of chemistry, they come with unique challenges as we try to adapt them into microelectronics for the first time. Chief among them is variability in their placement and their electrical properties. The Stanford work, that looks at designing circuits taking into consideration such variability, is therefore an extremely important step in the right direction,” Supratik Guha, Director of the Physical Sciences Department at the IBM Thomas J. Watson Research Center . “This is very interesting and creative work. While there are many difficult challenges ahead, the work of Wong and Mitra makes good progress at solving some of these challenges,” added Bokor. The Stanford design approach has two striking features in that it sacrifices virtually none of CNTs’ energy efficiency and it is also compatible with existing fabrication methods and infrastructure, pushing the technology a significant step toward commercialization. The Stanford team’s work was featured recently as an invited paper at the prestigious International Electron Devices Meeting (IEDM) as well as a “keynote paper” in the prestigious IEEE Transactions on Computer-Aided Design of Integrated Circuits and Systems. “Many researchers assumed that the way to live with imperfections in CNT manufacturing was through expensive fault-tolerance techniques. Through clever insights, Mitra and Wong have shown otherwise. Their inexpensive and practical methods can significantly improve CNT circuit robustness, and go a long way toward making CNT circuits viable,” said Sachin S. Sapatnekar, Editor-in-Chief, IEEE Transactions on CAD. “I anticipate high reader interest in the paper,” Sapatnekar noted. Be the first to comment on "Designing Circuits Containing CNTs for Highly Energy-Efficient Computing"